By Abi - Chile - 17 Mar/03 - Viewed 1699 times. We took the bus from El Calafate to Puerto Natales to get to the Torres del Paine National Park. We spent the night in a small hotel and did our grocery shopping for the next camping trip which would last 5 days. It took several hours to get to the Park from Natales on a single dirt road. It seems that the drivers don’t really care which side of the road they drive on, they just choose whichever is better. There are 2 different ways to hike the most scenic areas of this park. One is the Circuit, which is basically a large circle around the central set of peaks, and takes seven days plus. The next is called the W (because it takes you up the three main valleys) and you can either do it forwards (west to east) or backwards. The Circuit was closed due to so much rain the week before, and we chose to do the W forwards. We had to take a ferry to get to the first site, called Camp Pehoe. We set off for our first destination in mostly sunshine, which was a nice treat. The terrain is really incredible, sometimes with lots of trees, and other times, much more flat and farm like. After about five strenuous hours, we arrived to our first campsite, Glacier Grey. It was a beautiful area where you could get very close to the glacier. After setting up camp, we took the 15 minute walk to get to the lookout point. By this time, it was about 6:30 p.m. and it was starting to get chilly and cloudy. I really wanted to get back and get dinner. Travis decided he would come back a little later to check out the glacier. We didn’t see any large ice chunks falling off, but heard them on our way there, so we just missed them by a few minutes. Unlike Perito Moreno, when this glacier would break off, the ice chunks would just stay right there in the lake, not really traveling very far. It was neat to watch the really large chunks just floating there and the brilliant blue coming through from the sunlight. During dinner we met a lady from Switzerland, riding her bike around Patagonia for 3 months. She told us of a way to get on the glacier, following a small trail, but it would take 30 minutes to get there. Travis decided to try it that evening. At this time, it was about 7:50 when he started out and he thought it started to get dark around 9:00 p.m. About 8:10 he noticed that, because it was cloudy, it was getting dark much sooner. So, he turned around to head back. About 8:20 he could hardly see anything, but could make out the ridge along the shore. But, the trail was leading into the woods and there it was extremely dark and he couldn’t see anything. He spent some time stomping around trying to listen to the different sounds the trail would make and when he wasn’t on it. He decided he was going the wrong way and further into the woods, so he turned around and got back out to the tree line. About this time he remembered he had the camera and used the flash to find the trail. Since the camera is digital and has an LCD display to view pictures on the back, he used one of the brighter pictures that we had to illuminate the trail his way back. In the meantime, I had set my watch for about 9:00 for him to be back before I started worrying. He was just in time before I got someone to help me look for him. From now on we decided we will make sure to have a flashlight with us wherever we go out in the evening. We left Glacier Grey in the morning and headed for our next stop, to Campo Italiano. This was our longest trek as we had to backtrack all the way (4+ hours) back to Pehoe and then head on 3 hours to Italiano. It was a difficult day, and one that caught us in the rain and wind. By the time we reached Italiano, we were beat. We quickly set up camp and called it a night. In the morning, we got up super early to start our hike to Campo Britanico. On the way we came upon a huge waterfall that was quite beautiful. It was crashing down and sort of hit a rock, and then twisted around. We were about an hour and a half into the hike when it started raining and we realized that our view was going to be non-existent. We still had another hour to get to the top, so we decided to cut our losses and head back down. In the meantime, we saw a man coming down who said it was worthless to go on up, so that confirmed it for us. We came back down and loaded up and headed on to Campo Cuernos. The hike to Cuernos was not too bad weather wise and while we continued to camp outside, we enjoyed warming up in the Refugio (a cabin with a dining/community area, and probably two dozen bunks for people who don't camp out). We could also just hang out here and read and chat with people, which was nice. That night, though, the wind was more fierce than I have known, in fact, our backpacks were laying on a picnic table and the wind blew them off! Our next hike took us to Campo Chileno, which was about 4 hours away. The map only states the distance in time it takes to get there, instead of kilometers, which would be better. Besides, whose time are they counting? We certainly discovered that it took us about an extra hour from however long they said it would take! Anyway, somehow we did arrive to Chileno in 4 hours and 15 minutes. I was psyched. Also, the weather was extremely nice, which we a welcome change. It was a nice walk, just a gradual uphill climb, unlike most of the other ones, which were very steep. The last � of the way was quite taxing, but I was excited that we had finally made it in the suggested amount of time! Perhaps we have finally warmed up to the terrain. We set up camp again and were in bed by 8:00. Typically, we have noticed that it starts to rain in the early afternoon, so we have been getting up very early to beat the rain. 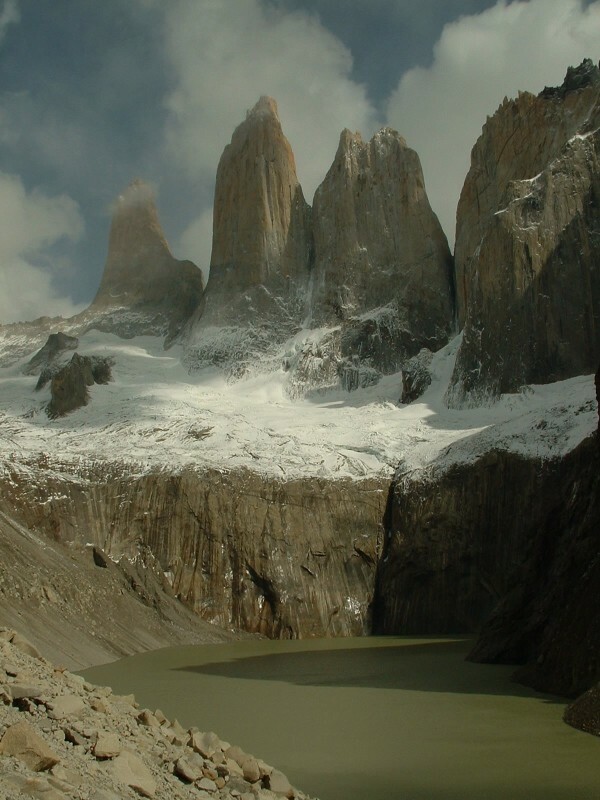 We did so again to try to see Las Torres. We got started about 6:00 a.m. and about � into our hike, it started snowing. Hard. Pretty soon we were in a complete whiteout and could see nothing! We camped out for a few minutes behind a rock, and then, since we could see the top, continued on since we were so close. We found a natural shelter that we hovered in for about 10 minutes, but since there was no wind accompanying the snow, it didn’t look like it was going to be letting up any time soon. I don’t think I have ever seen such big snowflakes and we were covered! But, we headed back down the mountain. In between the top and Camp Chileno, there is another smaller campground, so we went to that to wait it out and see if it would abate. After about 20 minutes, the sun actually came out. Travis decided he wanted to climb it again, but I had had my fill. It was probably the hardest climb I have ever done, straight up, over large boulders. Besides that, I was soaking wet and freezing, so he went on by himself. This time I asked him at what time I should start to worry about him! I got back to Chileno about 45 minutes later and had a hot shower and lounged the rest of the day. Travis came back around 2:00 and, although he got caught in another snowstorm, he was successful in seeing some beautiful views of Los Torres. They truly are magnificent. It was very intermittent alternating with rain and sun throughtout the day. We camped here another night and the next morning, headed down to the next Refugio where we caught the bus for Puerto Natales. What I enjoy about South America is that they are not worried about anything, especially the time. The bus was supposed to come at 1:00. At 12:56 I verified that it was coming and the man assured me that it would be here in 5 minutes and not to worry. At 1:42 it arrived. That was the longest 5 minutes, but we didn’t mind! We were dry and it was pouring outside, so it was nice to be able to be inside. Our next trip takes us to Punto Arenas, Chile and then on to Ushuaia in Tierra del Fuego, Argentina. Originally, it wasn’t in our itenerary to make it all the way down there, but we’ve heard such great things about it that we decided to go and had time before our boat trip up to Puerto Montt next week. Hopefully we’ll catch some nicer weather soon!